You log onto your favourite online store. You’re greeted by a banner ad offering a special deal on a coffee machine you searched for last week. You click on the ad, but are disappointed when the price on the machine is still too high. However, you see a list of recommended alternative coffee makers on offer below. You browse through them and are lucky to find the perfect alternative in just the right price range. You add it to your cart. You’re about to check out when a popup appears. A new book by your favourite author has just been released. You hesitate for a moment. You didn’t plan on buying it in hardcover, since it’s almost twice the price of a regular paperback. The thing is, you really like his work and don’t want to wait three months for it to become available in the cheaper format. You add the book to your cart and click Check Out. Many of us will have experienced this kind of situation, and it doesn’t happen by chance. Brands across all industries are spending significant amounts of time, energy and, of course, money, to ensure their websites are optimised to better understand the individual preferences of their users. This provides them with the critical data they need to take advantage of conscious and subconscious patterns of spending that ensure we don’t leave an online store “empty handed”. The numbers don’t lie, and they show that these practices are having an impact, with more people are engaging in online shopping than ever before. But when it comes to total brand sales, is online all it’s cracked up to be? 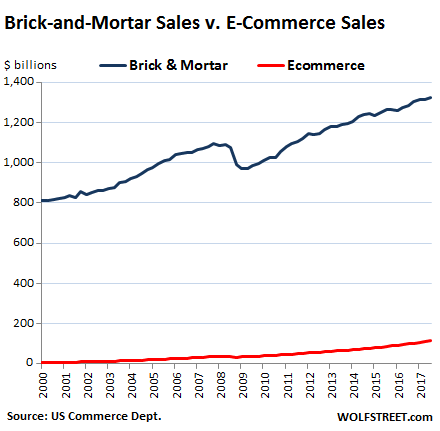 There’s no doubt that online sales are improving, and there are definitely some retailers who are struggling with the current brick and mortar retail space. But the simple fact is that this: people still make purchases from traditional stores and it counts for the overwhelming majority of a brand’s sales in the US market (approximately 90% of sales were made in traditional retail stores). This leaves us with an interesting observation of the US retail market, and what it might mean for other markets: if online is growing, at least part of that reason is because of all the resources retailers are putting into optimising the customer experience on their websites and online stores. But why aren’t the majority of brands doing the same for the retail environments? The application of this approach to an offline store surely would have a positive effect? Those that are trying to take advantage of analytics and big data are seeing massive returns on their investments, but why aren’t the majority of retailers doing this? If you agree that this is the approach we should be taking with our physical brick and mortar stores, but aren’t sure what solutions our available, we’ll be introducing some of the latest technologies that you can take advantage of in your store. As a retailer, there are a number of different tools you can use to gather data and optimise the retail experience for your customer. The modern POS system does more than just keep track of purchases and inventory in your store. It has a number of technologies that you can use to improve your understanding of your customer and your sales. Thanks to centralised databases, customer sales can now be tracked across branches. This allows you to better understand what customers are buying on a regular basis. You can also gather data far quicker and more accurately with a modern POS system. This also means you can generate reports and gather insights much faster than before, and these reports can be presented in a simple visual format that's easy to understand. The latest POS technology also offers additional benefits like allowing you to better manage stock and inventory across all your stores, best selling items and many more. The latest in eye tracking technology is unobtrusive and easy to set up. Once in action, it will allow you to create visual heat maps so that you can better understand the subconscious focus of your customers. This allows you to identify what your buyers are drawn to in your store, what they ignore or miss, and what might be distracting them. You can then take take steps to improve customer engagement in your store. For example, you can adjust the presentation of items on your shelves so that customers are more aware of specific items, or using your insights to improve your in-store marketing materials. The latest in foot traffic technology offers more than a simple measurement of how many people enter and leave your store. These solutions can track how people move through your store, giving you a better understanding of what they're stopping to engage with, and what they're simply ignoring and passing by, as well as identifying how much time they are spending in your shop. Some solutions also work outside your store, tracking the behaviour of people walking by and identifying if they stop to engage with your window displays. How a customer makes their way around your stores can also be tracked across multiple locations, so that you can see how each store is performing and make adjustments to improve customer engagement. Like other modern digital analytics tools, people counters can track results in close to real time, and generate easy-to-consume visual reports that offer even deeper insights into how customers engage with your store. Imagine a customer, tired from work at the end of the day, is walking past your store. The window display, which you’ve been modifying and tweaking based on data from your foot traffic solution, catches their eye. Without thinking about it, they enter your store. Suddenly it feels like they’re taken out of the stresses and pressures of their day-to-day lives, and into a place that feels truly special. They glide effortlessly from product to product in an experience crafted to draw their attention and appeal to their desires, which would not have been possible without eye-tracking analytics. They pick an item that speaks to them, and walk up to the cashier. As they’re ringing it up, the centralised point-of-sale database informs the cashier that there is a unique offer on an item that the customer regularly buys at another branch. The cashier tells them about this special offer, and the customer, pleased that you truly understand them, asks if the cashier wouldn’t mind waiting while they quickly go grab one. They pay for their purchases and leave with a smile on their face, having not just visited a store, but having spent their time in a place filled with caring people that truly understands them. If you are interested in a cutting-edge foot traffic solution to implement in your retail store, be sure to check out Blix. Blix offers an advanced solution that uses WiFi networks to anonymously track smartphones signals, so that you can measure foot traffic in incredible detail. Our foot traffic solution offers features such as customer flow, which helps you understand how people move and spend time in your store, customer loyalty tools that allow you to track customer visits across all your stores, and many other benefits that traditional foot traffic solutions don’t offer. To find out more about Blix, visit our website or contact us today.